An elderly Houston man filed a lawsuit for more than $1 million against United Airlines last week alleging an employee pushed him to the ground at an airport in 2015, according to Houston outlet KPRC2. The station recently obtained video of the incident, and, two years later, United apologized for what happened. 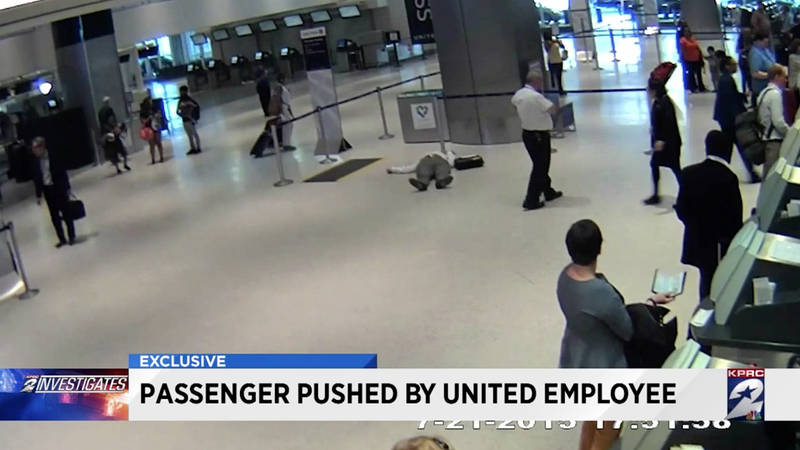 KPRC2 reports that the surveillance video below shows Ronald Tigner, 71, being pushed to the ground by a United employee near the airline’s ticket counter at Houston’s Bush Intercontinental Airport in 2015. The footage shows Tigner laying motionless on the ground with no United employees checking on him, and his attorney told KPRC that the first person shown attending to him was a passenger and nurse. In the lawsuit against United, the employee who pushed him and another employee, Tigner claims that the situation started with him asking for a new boarding pass because the printing on his was distorted. Anastasia was later charged with the felony crime of injury to an elderly individual, ordered to pay a fine, write a letter of apology and attend anger-management classes. Tigner’s attorney said he was knocked unconscious after the fall, and that he looked “lifeless for minutes” without anyone checking on him. His attorney told KPRC2 that no one went to check his pulse and “left him there like a piece of garbage.” Tigner is suing the second United employee mentioned above for negligence, according to KPRC2. From the statement released to KPRC2, it sounds as if United didn’t even have knowledge of the incident before now. But being charged with a felony sounds like something an employee would have to disclose, so it would be even worse if United did indeed wait until video came out to apologize for things. This just adds—in a non-chronological way—more to the ongoing United mess that’s caused a PR nightmare. It all started with a bloody passenger dragged from a plane, then continued with a wedding-bound couple kicked off of a flight and the death of a giant rabbit. There’s been plenty of other airport drama, both with United and other U.S. carriers, in that timespan. The United PR nightmare, at least, meant you could grab some cheap tickets for international flights on the airline back in April. But these days, international flights come with even more headaches than wondering if you’ll be assaulted or kicked off of the plane.